Screenshot of Anders Behring Breivik's Trial, Day One. Geir Lippestad, his defence counsel is on the left. Youtube. Rosemary Bechler (RB): Do tell us why you are here in Lisbon, at a Council of Europe conference for Intercultural Cities? Geir Lippestad (GL): I am the Vice-Mayor of Oslo, responsible for public ownership, diversity and business. I am here to learn more about diversity in our societies and also to tell people how we work in Oslo on the diversity front. RB: Can I take you back to a dark chapter in Oslo’s history and the shock, apart from the horror of that shooting spree, at Anders Breivik’s explicit targeting of ‘multiculturalism’ as the enemy. Was it a shock for your society, or had this kind of pathology been anticipated? GL: No, it was a shock of course. This rightwing extremist was born in Oslo, raised in Oslo, went to our schools and apparently there was nothing especially weird about him. But he became a rightwing extremist and as you say inflicted the worst attack on civil society in Norway since the second world war. So that in itself was a shock. But it was also a shock that as a rightwing extremist he attacked the Labour Party, and not only its politicians, but the children of those politicians. So he wanted to wound them as much as possible and he explicitly stated that he wanted to hurt them because their fathers and mothers had ‘ruined this country’ and therefore the right for ‘my children to grow up in a rightwing extremist society’. So it was horrible and a shock for Norway. But on the other hand if we look at the history of Norway, there have been around 15 terrorist attacks in the last thirty years – all of them by rightwing extremists: none of them from Muslim extremists. There have been around 15 terrorist attacks in Norway in the last thirty years – all of them by rightwing extremists: none of them from Muslim extremists. RB: Since you were closely involved in that trial, did you feel you learned something about this hatred of ‘multiculturalism’? GL: Yes, yes, I learned a lot as a lawyer in that case but also in previous cases. Almost twenty years ago now, I had a case where two young Nazis knifed a young black guy to death just because he was black. I spent three, almost four years on that case, and I was able to dig into what happened to these three young people living in Oslo, who seemed to have enough to live on, a place to go to school, everything. So why had this taken place? I asked myself the same question in the Breivik case and I don’t know if I have the complete answer. But of course, we politicians have a great responsibility. When politicians talk about ‘other people’, when we talk about ‘multiculturalism’ – of course no-one ever suggests that anyone should go and kill people, but we know that people are asking themselves, is it a trap, or is it something good? Then, in America today, for example, everyone who listens to Donald Trump thinks that ‘multiculturalism’ is a trap they don’t want to fall into. And this triggers something in just a few people, which is very dangerous – people who see themselves as crusaders who save the country from itself. They go into action. Of course it is not the responsibility of leading politicians that people kill, but we must pay much more attention to how we speak and why we speak, and that is why this conference is so important. Because we also have to speak out about the many advantages that come from ‘multiculturalism’. And that is why I am here, to learn and to talk more about what I am also learning about those advantages. RB: You said that these few rightwing extremists are also animated by the desire to save their country. Could we see a link between this and larger scale effects, for example, the Brexit call in my country to ‘take back control’? These were the saviours of our national ‘sovereignty’ demanding a country which would once again be more about them than about the ‘others’. I can see that tackling this is a huge challenge for politicians, because it is precisely now in the era of globalisation, when they feel they have to convince us that they too are working to secure the nation. I don’t know if you remember the moment in the UK when Gordon Brown, for example, chose to start talking about “British jobs for British workers.” So much of the paraphernalia of what we might call ‘majority reassurance’ is vested in this monocultural ‘National Us’ whether in sport, celebrating our monarchy, or memorializing our roles in twentieth century world wars. So when do politicians get to talk meaningfully about diversity? GL: It’s a very important question. Take Norway for example. There is only one big city in Norway, and that is Oslo with 700,000 people. One third are from parts of the world other than Norway and it is the only city that is like that. And people in Oslo are not afraid of diversity. In our recent elections, they voted for the Labour Party, the socialist left, the Green Party. But people in the countryside, people who live in places where they have almost no diversity and don’t see people from other parts of the world, are afraid. I tried to find out: “what is this?” What happened to these small communities? 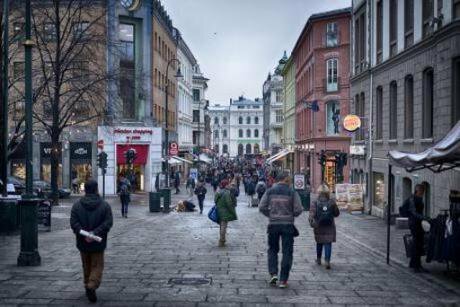 The young people move out of these small communities: they want to live in the city and they move to Oslo with its blooming multicultures, and the university which is a huge cultural scene in itself. You can meet people from all over the world. The rest of those communities stay behind, and of course they feel that they are the losers. And they are losing. But the enemy is not diversity. On the contrary: what they don’t see is that diversity is the answer and that it is what is making Oslo such a popular city! What I am trying to say is that it is extremely important that all cities engaged with diversity, should try to have a plan, a form of organization, and to underline the good things about diversity. What are they? It can create jobs if you are doing the right things, and new cultures if you can stay open and new people come to your little town – people can learn a lot. So it is so important to have a plan, and to communicate this plan very effectively. It is so important to have a plan, and to communicate this plan very effectively. We saw when we had the refugee crisis, how small villages in Norway who set up refugee camps reacted when they started closing down because there were no more refugees. Many of them started saying, “Give us back the refugees!” Because they had become friends with the refugees! If you don’t meet a man or woman from Syria, you may be afraid of the hijab, or of the men. But if you meet them, maybe in another village, then you can start a dialogue. So yes, this is the question and we have not found all the answers of course. But we must talk, not only about what is costs to have a refugee policy, or a diversity policy, but that it is completely essential to create jobs and to have a prosperous country. Of course we have to do the research on that and how to frame our recommendations on that, and then we have to produce the results! RB: Earlier today, the point was made that this is also about being able to talk about the inequalities in our societies. Do the people who feel themselves to be the losers actually get included in enjoying those multicultural festivals which we have been hearing about? GL: I think that they must be. But maybe we are not good enough on that front. You were talking about Breivik. When I talked to him about those things and asked him, “Why do you hate people of a different skin colour from yourself?”, he has lots of answers. But I can see from an old photo when Breivik was in his second year at school that he was together with a boy who was totally black. I asked him,” Did you like him?” He said, “Yes, of course, he was my best friend!” “How can you become best friends with this guy?” Breivik said, “He’s not like the rest of them!” And when I talked to the young Nazis, they said the same thing. ”I hate them, but he’s not like that”, because they know him. So it is very important, as we said, that when we have big festivals, it must be a festival for everybody! And as I was saying earlier today, our diversity campaigns must not be narrow – they must be much wider, not just concentrating on students or on certain people in certain departments ­– and that it is the ways we meet that are most important. RB: We’ve just come out of a session in which you were asked how in Oslo you set about achieving an ‘interculturalism’ or ‘diversity advantage’? Can you tell me a bit more about this? GL: In Oslo now we are trying to take traffic out of the city centre, and we have begun to talk about what we should put into this city centre when cars are gone. Of course people. Oslo like many other capitals is a divided city: there is an east part of the city and a west part. But we are working very hard to find ways in which people from the east part of the city can be tempted into the centre with people from the west parts of the city. So that people from all over the city can meet up and talk and eat, and go to poetry festivals and everything else that you can offer in a city. But we are working very hard to find ways in which people from the east part of the city can be tempted into the centre with people from the west parts of the city. RB: Earlier you were talking about a marvellous hotel in Oslo which is used as a training opportunity for all sorts of skills and services. I wanted to ask you if that was only used for training recently-arrived migrants? GL: No, at the hotel, everyone get the opportunity from people with Downs syndrome to people with psychiatric and social problems and all the rest. In Oslo there are different kinds of small businesses that offer this kind of apprenticeship, but among them this small hotel in the centre of Oslo, owned by the municipality jointly with a private sector business partner. It is important that it is small because we have a scheme we call ‘place and train’. There are forty rooms when there is a full house, and there is a ground staff who are professionals who know everything about running a small hotel and also about managing their staff and human nature. People who come and stay at the hotel will not know if the people who attend to them have psychiatric problems or if I am a refugee, though they may recognize if I have Downs syndrome. But they just see in reception, in the kitchen, in the cleaning and upkeep, marketing and everything to do with hotels, a smooth-running establishment. What is important is that people have a normal job of work to do. This small hotel is working in cooperation with a group of big hotels just across the road, so that when people have been trained up, they are guaranteed work in a real hotel with a normal salary just the same as other workers. So our hotel is the guarantee to others in the business that they have the necessary skills. We have another example in the health sector where people with psychiatric problems are learning how to become skilled up for working in welfare centres. When they have the skills they go and work there, not as helpers but as workers. What has happened is that people who go into these programmes see that work is waiting for them. So their motivation is very high. There are other programmes where people just sit in a classroom and learn Norwegian and something about Norwegian culture and don’t have the work waiting for them, and they don’t have the motivation. Maybe they have six kids, or are from poorer families and they need a lot of help. But it is also important that people from Oslo see that when people are trained to work in the hotel, they then seize the first opportunity to work and to pay tax, and contribute something to the society. So it is a win-win situation for all concerned. This has become one of the most popular hotels in Norway, because the atmosphere is so special. You should go there! RB: And do you think this hotel also demonstrates the ‘diversity advantage’? Oslo streets, 2017. Flickr/ Tydence Davies. Some rights reserved.